Everyday i meet many of growth colleagues, friends and some social life, both in the virtual world and reality. Although not much, but the average of my close friends is a positive group of people, with positive thinking and positive attitude. But there was some groups that have always lived in a negative habit. One is in the setting of their dreams ... I often heard complaints from trader friends with the words "I give up", "I can not", "It's not my field," "He's a born rich" and many more reasons. Lately I am curious and interested in one of the events on cable tv, Britain's Got Talent. A simple stage, apart from the hubbub. But I was curious and inspired by one of the contestants long after I did 'searching in google' with keywords TOP 10 Britain's Got Talent. Yes, there is a 47-year-old woman, and you've probably already know about Susan Boyle, but let me quote articles from various sources regarding this woman for the uninitiated. She obviously did not have the appearance of the artist. Chubby, 47-year-old (at the time), clumsy, how to dress up so mediocre. The Britain's Got Talent judges-including Simon Cowell is best known for the sharpness of his tongue in the American Idol-doubting Susan Boyle when she appeared on stage. Similarly, the audience who saw the shooting in the British talent show. But when Susan Boyle sang opera, "I Dreamed a Dream" from Les Miserables, all amazed. Her voice is very beautiful, very melodic, making the audience repeatedly applauded standing. The jury -Cowell, Piers Morgan and Amanda Holden-join amazed hear the amazing sound of Susan Boyle. Oprah Winfrey invite her to sit on her couch in an event watched around the world. She does have a decent life story told at the Oprah Winfrey Show. Not only the appearance of being "celebrity" but also life itself is quite dramatic. At birth, she had run out of oxygen and makes a little abnormal brain development.At the school, she was slightly retarded and often ridiculed by her friends. But she frequently came to the theater to watch the professional singer. About 14 years ago, she auditioned for the television show My Kind of People. But she was so nervous that makes her failed. Boyle sings so serious when she learned from a vocal coach, Fred O'Neil. A decade ago, she had been recording, titled "Cry Me a River" for the turn of the millennium anniversary album in her native village. Her mother, until died two years ago at the age of 91 years, continue to push for her daughter joined the national singing competition, not just a local singing contest that several times she won. But Boyle was not ready. Her first performance after her mother's death was in front of Simon Cowell that shook the world. Shortly before appearing, Cowell was asked about the age and other small things. Boyle claimed to have never dating. Never been kissed. Now also live only with a cat in her home. Stage that makes this history makes her invited to Oprah. Cowell, the judge who is also a producer, you know the meaning was invited to appear on Oprah Show. "If she goes to Oprah, I think the chances of Susan Boyle had a number one album in America." 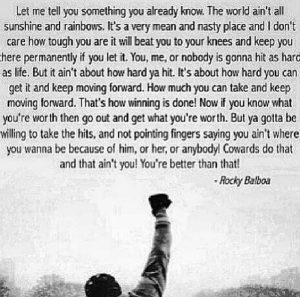 (Quoted from tempo) And there is one more thing that made me really inspired on the old movie "Rocky Balboa", remember? Words of wisdom that inspire me. Let me quoted for you. “Let me tell you something you already know. The world ain't all sunshine and rainbows. It's a very mean and nasty place, and I don't care how tough you are, it will beat you to your knees and keep you there permanently if you let it. You, me, or nobody is gonna hit as hard as life. But it ain't about how hard you hit. It's about how hard you can get hit and keep moving forward; how much you can take and keep moving forward. That's how winning is done! Now, if you know what you're worth, then go out and get what you're worth. But you gotta be willing to take the hits, and not pointing fingers saying you ain't where you wanna be because of him, or her, or anybody. Cowards do that and that ain't you. You're better than that! Both of these stories make me amazed and realized: the difference between having a dream and believe in our dreams. May be the inspiration of friends traders all, one day it will become a reality.